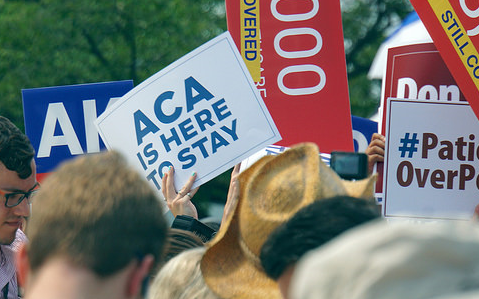 King v. Burwell is Decided, Now What? Last Thursday, the Supreme Court voted 6 to 3 to uphold the premium subsidies and cost sharing reductions in the Affordable Care Act for residents of states using the federal health care exchange. Since the decision, much has been written about the case and where health care reform goes from here. There’s a lot out there, so we’ve created a guide to help you put the ruling into context. Vox provides a helpful flash card deck summarizing the case and what we avoided with last week’s decision. Ezra Klein of Vox reminds us that beyond any political victories, this was a win for the 6 million people who can keep their health insurance. Brian Beutler of the New Republic writes that this is the last real attempt to gut the ACA in the courts. Ron Pollack of Families USA writes in Health Affairs that King v. Burwell is a turning point for health care reform and describes what comes next. Henry Aaron of the Brookings Institution writes about what the healthcare landscape will be when the next president takes office in 2017. Ben D’Avanzo and Claire McAndrew of Families USA wrote a guest blog for the Alliance for Justice, highlighting some other needed improvements to our health care system. This entry was posted in Max Friedman and tagged Affordable Care Act. Bookmark the permalink. 1 Response to King v. Burwell is Decided, Now What?